Johnny wanted to order fried rice for dinner, but I offered to make some at home instead! I still had some leftovers I wanted to use, so this was the perfect opportunity. I was able to use some veggies from the Christmas platter and the steak and mushrooms from Gene & Georgetti's. 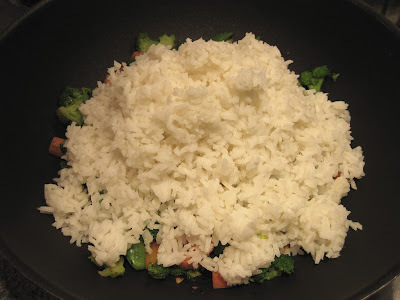 Cook the white rice and set aside. Let your stovetop wok heat up, then add the oil and the veggies (except the mushrooms) and garlic. Put the lid on so they can become tender. Throw the cooked rice on top and add the sauces. Stir around until everything is incorporated. Make a small well in the center and crack and scramble the egg until it is cooked and then stir to mix. Finally, add the steak and mushrooms to come up to temperature. These were already full cooked, so they only need to be warmed. Christina - that looks amazing!! Good job! And the Omaha steaks my SIL gave us? They were awful. It was "precooked prime rib" which is our least favorite cut of meat - my SIL reads my blog, so I had to be nice! If I hadn't gotten a pretty photo of you in the mail this holiday season, I woulda thought you were Chinese!! Awesome fried rice girl! Yum! Looks fairly similar to the spicy chicken stir fry I posted on my blog last week (minus the egg). I have a lot of these ingredients on hand, so maybe I'll make it again! Sweet and Savory (sorry! I don't know your name I just realized) fried rice is one of my go-tos for using up leftovers! Gets rid of already cooked meat and when I buy too many veggies at the grocery store. Oh that looks really good! I have never made fried rice, but with the beef and mushrooms it looks like it would be a big hit in my house! Oh yum - I may just take some inspiration from you and make this sometime this week! We make fried rice all the time! It's a great way to use up leftovers. It seems like fried rice has become a staple as of late, but I haven't made it with beef. Looks great! PS: i cant believe you have gone all over the US too!!! you just elevated the simple, boring fried rice to a whole new level with that steak! I can't believe I'm saying this to RICe...but MMMMM!! !